Using a meat mallet+, pound the chicken thighs to ½cm thick. Place the garlic, paprika, caraway seeds, wine, salt and pepper in a medium bowl and mix to combine. Add the chicken and toss to combine. Refrigerate for 15 minutes to marinate. To make the spaetzle, place the flour, eggs, buttermilk and salt in a large bowl and whisk to combine. Bring a large saucepan of salted water to the boil. In batches, push spoonfuls of the spaetzle batter through the holes of a colander into the boiling water to make small dumplings. Cook for 1 minute or until the spaetzle rise to the surface. Remove with a slotted spoon, set aside and keep warm. Repeat with the remaining batter. Place the flour, salt and pepper in a medium bowl and mix to combine. Place the eggs and buttermilk in a separate bowl and whisk to combine. Place the breadcrumbs in a third bowl. Dust the chicken with the flour, dip into the egg mixture and press into the breadcrumbs to coat. Heat 3cm of the oil in a large frying pan over high heat++. Cook the chicken in batches, turning, for 3–4 minutes or until golden and cooked through. Drain on paper towel, set aside and keep warm. Heat a large frying pan over high heat. Add the butter and cook for 3–4 minutes or until it starts to foam. Add the sage and cook for 1 minute. Add the spaetzle and toss to coat. 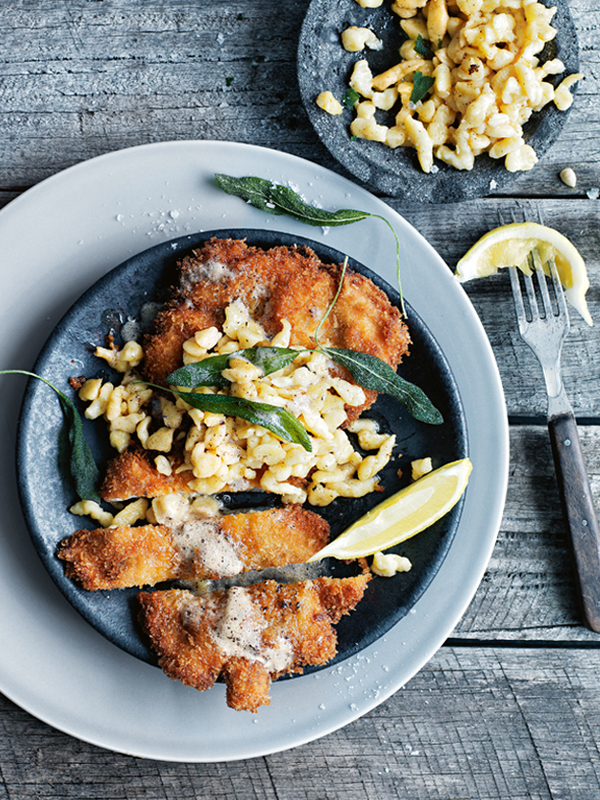 Divide the schnitzels between serving plates, top with the spaetzle mixture and serve with lemon wedges. Serves 4. + When pounding the meat for your schnitzels, place it between two sheets of non-stick baking paper. If you don’t have a meat mallet, you can use a heavy rolling pin or the bottom of a heavy frying pan. ++ When shallow-frying your schnitzels, first test if the oil is hot enough by scattering a few breadcrumbs into the oil. It’s hot enough when the oil foams around the breadcrumbs.